With a 2650 square foot LiveRoof® Green Roof installed on the Honnen Ice Arena, Colorado College moves closer to its goal of becoming Carbon Neutral by 2020. Colorado College has long-embraced sustainability through a progressive plan of tangible initiatives to address energy consumption, sustainability in the dining halls, water resource policies, waste and recycling practices. Living roofs provide important energy reduction benefits such as reducing this ice arena’s use of air conditioning during warmer months, while the plants will serve to sequester carbon emissions. Colorado College is actively pursuing goals such as preserving regional and community water supply by reducing potable water usage by 50%. The institution incorporates operational strategies including storm water management and treatment, water-efficient landscaping, and water-use reduction making a living roof a natural fit for this campus. Green roofs reduce stormwater runoff by 65-90 percent in the summer and 25-40 percent during winter months by utilizing succulent sedum plants. The drought-tolerant sedums have been custom-grown for this rooftop garden to match the local climate. The result is a low-maintenance green space that reduces heating and cooling costs, extends roof life, lowers noise pollution and provides a natural air filtration system. At Colorado College, sustainability encompasses elements of the entire campus. Built in 2005, the 54,123-square-foot Russell T. Tutt Science Center was the first building in southern Colorado to earn LEED certification, and the first LEED certified science center in the country. Colorado College has also received LEED Gold Certification for the Cornerstone Arts Center. The College is also a member of the United States Green Building Council (USGBC) and the local Southern Colorado Green Building Council. Jewett Roofing, in partnership with Duro-Last, installed the green roof at the Honnen Ice Arena. The new LiveRoof® green roof covering Honnen Ice Arena features a patented, subterranean modular system that unites soil and plants creating a beautiful, meadow-like aesthetic. This green roof is cost effective, providing operational and maintenance cost savings from increased roof life, reduced energy use and stormwater management. The living roof will also reduce noise, protect air quality and provide natural beauty. Yesterday, Western Technical College’s new green roof was featured on WKBT TV 8. 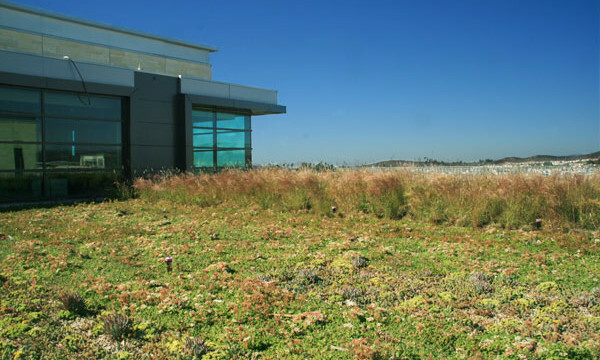 The green roof system features an irrigation system with “smart” controls to help deliver irrigation on an as-needed basis, taking into account weather and soil moisture conditions. 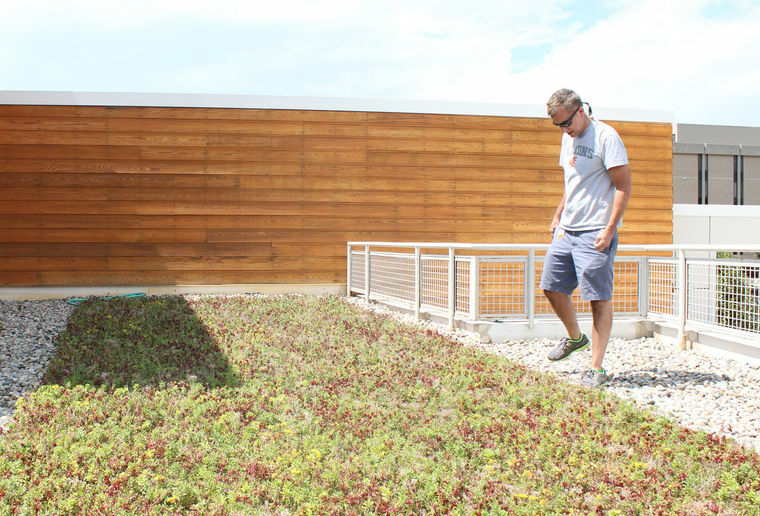 The green roof was custom grown by LiveRoof Licensed Grower Bachman’s Inc. The design features multiple plant mixes selected for high performance and to meet this rooftop’s specific cultural needs. Today, KU’s School of Business Capitol Federal Hall celebrates its public grand opening. A key feature of the sustainable building is a vegetated roof, and the university is working educate students, staff and the community on the benefits provided by their new green roof system. See our press release to learn more about this living roof, which was supplied by LiveRoof licensed grower Roof Top Sedums. A public grand opening for Capitol Federal Hall is set for 4 to 7 p.m. today at the new building, 1654 Naismith Drive. After the event, the building will not reopen again until June 7, when faculty and staff have moved in and KU summer classes begin. Learn more about the building in this article by the Lawrence Journal-World. The contractors worked hard to prevent a disruption to traffic on the campus. While this led to additional material handling, the installation team succeeded with a beautiful end result. Students at BGSU are serious about sustainability. As part of this dedication they have used the Student Green Initiative Fund to add several green features to the Bowling Green State campus. Included in these features are several bike racks topped with the LiveRoof green roof system. These bike racks help to mange stormwater runoff. In addition to the green roof bike racks BGSU students have added vehicle charging stations and LED lighting around the campus. These additions have all be student driven projects and have totaled over $500,000 in total investment. To learn more about the green roof bike racks, read this article from our news section. To learn more about the Student Green Initiative Fund read this article from BGSU News. A LiveRoof® system and underground water treatment chambers provide unique stormwater management system. What once was a hot surface parking lot in downtown Athens, Georgia, is now the environmentally responsive Georgia Heights collegiate housing community. 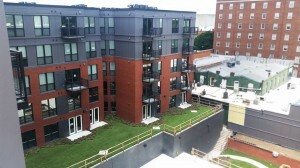 EdR, one of the largest developers, owners and managers of high quality collegiate housing, has thoughtfully designed and engineered the recently opened Georgia Heights to be an eco-responsible housing development. The design includes underground water quality treatment chambers and a 1,200 square feet LiveRoof rooftop garden. These systems all work in concert to help trap, treat storm water, and filter out impurities, in addition to cooling surface temperatures. Smith Planning Group, a civil engineering, land planning, and landscape architecture firm, worked with LiveRoof and James Greenhouses to incorporate green infrastructure on the project. “Athens deserves projects that go beyond what’s expected. From the street, you may not be able to see all the engineering at play or enjoy the beauty of LiveRoof that lies behind the stunning facades, but you should have comfort in knowing it’s there,” adds Lane. The general contractor for the project is the award-winning Juneau Construction, and the vegetated roof was installed by Valleycrest Landscape Companies. Green roofs provide nature, function and beauty. A patented, subterranean modular system unites the soil and plants creating a naturally beautiful meadow-like aesthetic. The roofs provide aesthetic, environmental and social benefits. Financial benefits can also be achieved from a vegetative roof including: extension of roof life, energy conservation, enhanced public relations, and conservation of municipal septic systems. 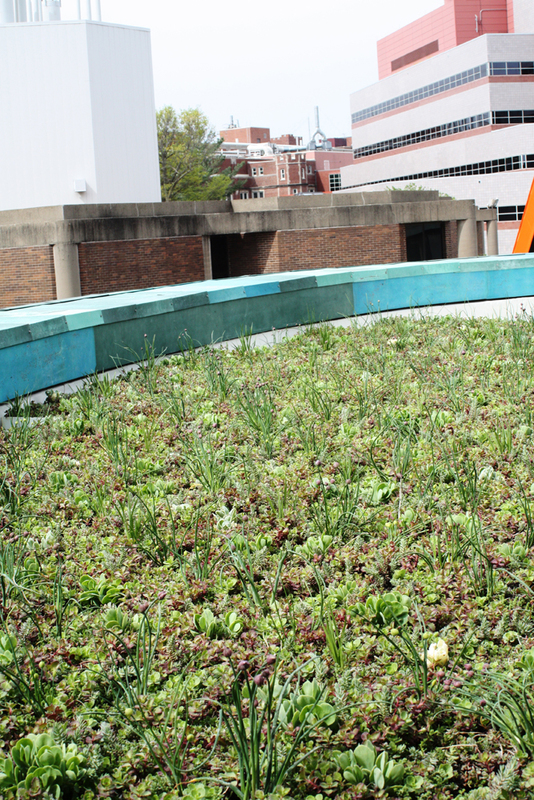 Bowling Green’s dining facility is now topped with a living roof. 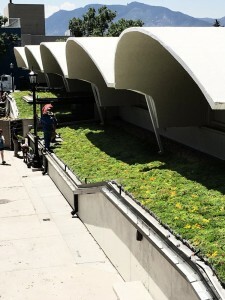 The green roof was paid for by the students through their optional ‘Green Fund’ contributions made each semester. The plants were custom-grown in the LiveRoof system by Corso’s Perennials of Sandusky, Ohio. 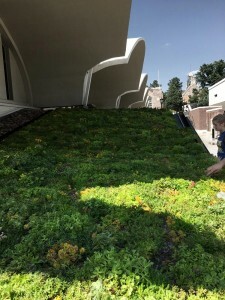 According to Nick Hennessey, the campus sustainability director, the living roof was added to the facility to help reduce costs of cooling the building, and to reduce stormwater runoff and its impact on the local community and waterways. Middlebury, VT – A living, planted roof system is currently being installed atop Middlebury College’s new Squash Center. The LiveRoof® Hybrid Green Roof System was selected for the living roof system, which should be completed by Friday, August 22. The new Squash Center opened last fall, with expanded playing space that has allowed for growth of the Middlebury Squash program. Men’s and women’s teams are able to practice simultaneously, the college is able to host more matches and tournaments, and the varsity athletes use the space to host training clinics for local youth. “The green roofs help contribute toward our initiatives to provide a sustainable living and learning environment for our students,” said Mark Gleason, the squash center project manager with Middlebury College. The modular green roof system will be delivered fully grown by Prides Corner Farms, the regional grower for the LiveRoof system, and will be installed by Apex Green Roofs. The green roof was designed by ARC / Architectural Resources Cambridge to look like an extension of the greenery of the athletic playing fields which surround the squash center. About Middlebury College – Middlebury College (www.middlebury.edu), one of the country’s leading liberal arts colleges, offers a rigorous liberal arts curriculum that is particularly strong in languages, international studies, environmental studies, sciences, and literature. About 2,450 students attend Middlebury, which was founded in 1800 and is located in the town of Middlebury in Vermont’s Champlain Valley. With the Green Mountains to the east and the Adirondacks to the west, Middlebury has established itself as a leader in campus environmental initiatives, with an accompanying educational focus on environmental issues around the globe. The college’s strong international dimension has extended its borders beyond Addison County, and includes Middlebury’s Language Schools, Schools Abroad, Bread Loaf School of English, Bread Loaf Writers’ Conference, School of the Environment, and the Monterey Institute of International Studies. About Prides Corner Farms, Inc. – Prides Corner Farms (www.pridescorner.com) is a family owned regional grower based in Lebanon, CT that has built its business over the last 30+ years by virtue of its incredible product diversity coupled with customer service that has set the standard for the industry. Based in Lebanon, Connection Growing over 2200 varieties of plants on 350+ acres, Prides Corner Farms has unparalleled local expertise. Since 2007, Prides Corner Farms has supported local designers and contractors as a leading supplier of green roof systems, and has custom grown over 100 LiveRoof brand green roof projects for the New England area. 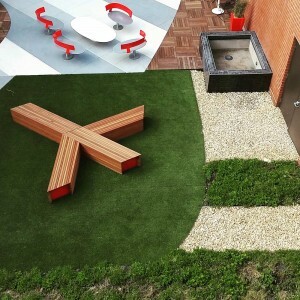 About LiveRoof – Based in Spring Lake, Michigan, LiveRoof® Global, LLC (www.liveroof.com) is the top horticultural science company in the green roof industry. Exceptional in design and function, the LiveRoof® Hybrid Green Roof System is the proven green roof system. LiveRoof establishes a healthy, sustainable ecosystem covering rooftops with seamless vegetation. Licensed regional growers customize plant selection for every LiveRoof project. They deliver the system’s modules abundantly vegetated with locally cultivated, full-grown plants for an instant green roof and trouble-free ownership. LiveRoof has been used on over a 1000 projects totaling more than 4,000,000 square feet. 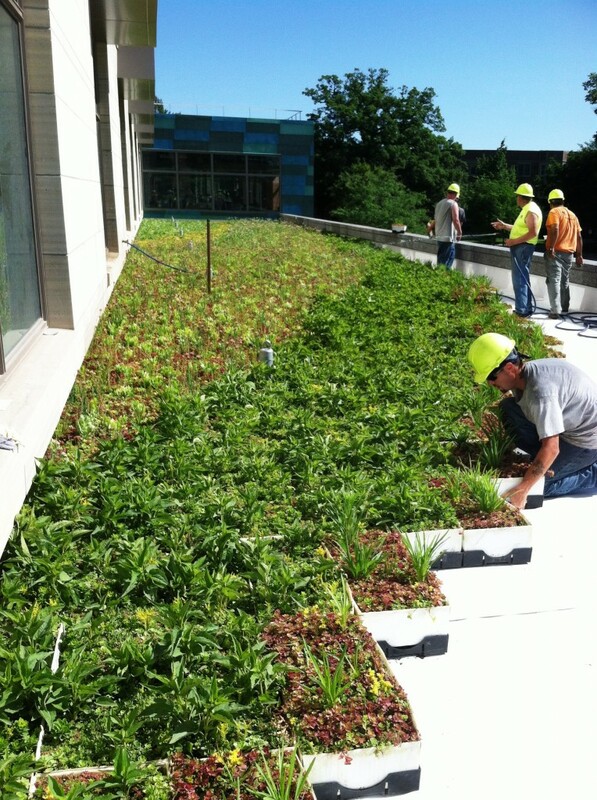 First Green Roof at the University of Iowa. The Pappajohn Biomedical Discovery Building (PBDB) is the site of the very first green roof on the campus of the University of Iowa. In addition to providing many environmental benefits, the green roof will give building occupants a gorgeous view. It features five unique sedum mixtures with a variety of perennial plants including Black-eyed Susan, alliums, liatris and hostas. The green roof uses the LiveRoof® Hybrid Deep System with six inches of silk and totals 6,440 square feet. 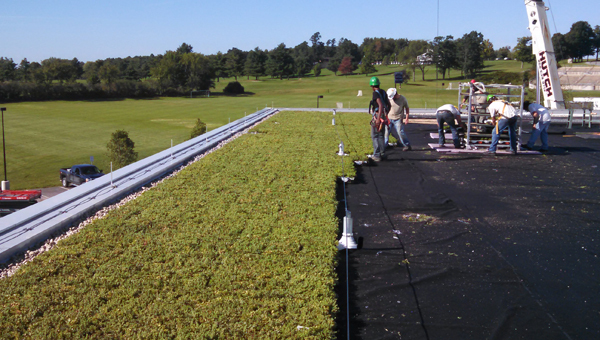 The pre-vegetated modules were grown by Roof Top Sedums at their location in Davenport, Iowa and then shipped to the building site and installed by LiveRoof® Certified Installer VIS, LTD. The 200,000-square-foot, six-story facility, located on the University of Iowa Health Science Campus, will house laboratory and office space dedicated to leading-edge, cross-disciplinary research involving scientists from across the campus. Designed by noted architect Gwathmey-Siegel, lab consultant Payette & Associates, landscape architect Confluence, and local architect Rohrbach & Associates, the building features include a vivarium, biomedical wet research laboratories, a linear accelerator, several MRIs, office suites, outdoor classroom and lush site landscaping. The building provides access through tunnel and bridge connections to adjacent buildings. Construction of the Pappjohn Biomedical Discovery Building is being overseen by Walsh Construction and is expected to be completed by the end of July, 2014. The green roof is one of the many green features that will be listed when UI officials seek Leadership in Energy and Environmental Design (LEED) gold certification for PBDB. Liz Christiansen, director of University of Iowa Office of Sustainability says green roofs support the UI 2020 Vision Sustainability Targets by providing several important ecosystem, economic and social functions. “They capture rainwater, filter it and release some of it slowly, thus reducing temperature and runoff impacts in the watershed. Green roofs protect the roofing membrane and prolong its life, as well as moderate the urban heat island effect. These benefits reduce long-term maintenance costs for buildings and grounds. Green roofs can help the UI achieve its goal in the area of energy conservation, because green roofs reduce the demands on building cooling, especially during periods of peak electricity demand. Green roofs can also provide urban outdoor space four building residents to enjoy,” she said. Members of the press may schedule an appointment by calling or emailing Natalie LInveille-Mass at (3099) 786-5142 or natalie@medialinkinc.com. For more information about the sustainable building practices at the University of Iowa, contact Liz Christiansen at (319) 335-5516 or liz-christiansen@uiowa.edu. About the University of Iowa: Founded in 1847, the University of Iowa is the oldest university in the state. The university is currently organized into eleven colleges, and offers more than 100 areas of study, as well as seven different professional degrees. The university is noted as the original developer of the Master of Fine Arts degree. The Beautiful campus spans over 1,900 acres and is also home to the University of Iowa Hospitals and Clinics; which has been named one of “America’s Best Hospitals” for the 23rd year in a row. Included in the university’s long list of esteemed associations are the active research memberships with several research coalitions including: The American Association of Universities, The Universities Research Association, and The Committee on Institutional Cooperation. The University of Iowa boasts an alumni network that exceeds 250,000. Read more about the project on The Daily Iowan website. California State University San Marcos (CSUSM) has installed its first green roof on top of its brand new University Student Union as part of the University’s commitment to sustainable building practices. The LiveRoof® green roof system provided by Florasource, Ltd. was installed on October 10 and 11 using LiveRoof’s pre-grown modular system. Members of the media are invited to view the installation by appointment. “The green roof was part of our LEED Gold Certification. By insulating the roof it helps with energy costs while creating an interesting venue on our outdoor rooftop patio,” said Scott Kirby, associate director of operations for the CSUSM University Student Union. The LEED program is the nationally accepted benchmark for the design, construction and operation of high performance green buildings. Certified LEED buildings cost less to operate and are a testament to the values of the organizations that own and occupy them. “The roof is very accessible; it is the upper most level of the student union, and makes up the north side of the plaza-like setting that offers seating and beautiful views of both the green roof and the hills to the north of campus,” said Tom Hawkins, LiveRoof’s Southern California rep and owner of Florasource, Ltd. The USU was funded through student fees and students played an important role in the design and construction process. The new building will be the new home of Student Life & Leadership, the Tukwut Leadership Center, Associated Students, Inc. and all of the social justice centers including the Cross Cultural Center, Pride Center and Women’s Center. A ballroom, meeting rooms and office space for student union operations and the university cooperation will also be included. “We are all eagerly awaiting the grand opening of this special building and look forward to the unifying impact it will have on our campus c0mmunity,” said Lutz-Chantung. Plant selections were proposed by LandLAB, a San Diego based landscape architecture firm, with review and input from Florasource Ltd. and Native Sons Wholesale Nursery, the LiveRoof Green Roof System sales and production representatives for California. The roof is planted with several Western U.S. native grasses and succulents and a number of plants of Mediterranean origin that will perform well in the inland San Diego county climate. View additional pictures and learn more about this green roof on the LiveRoof Project Showcase or on Flickr.com. About Florasource Ltd. – (www.florasourceltd.com) Based in San Clemente, CA, Florasource Ltd. is an independent horticultural supply firm dedicated to providing growers and grower-retailers with both innovative and time-honored young plants for growing. The firm also supplies the design and construction trades, as well as homeowners, with applied horticultural products to support a sustainable existence. Florasource Ltd. is the Southern California Sales Representative for LiveRoof®, the first hybrid green roof system, and partners with Native Sons Wholesale Nursery, producer of the finished LiveRoof modules and the LiveRoof representative for Northern California. About LiveRoof – Based in Spring Lake, Michigan, LiveRoof®, LLC (www.liveroof.com) is the top horticultural science company in the green roof industry. Exceptional in design and function, the LiveRoof® Hybrid Green Roof System is the most refined horticultural solution. LiveRoof establishes a healthy, sustainable ecosystem covering rooftops with seamless vegetation. Licensed regional growers customize plant selection for every LiveRoof project. They deliver the system’s modules abundantly vegetated with locally cultivated, full-grown plants for an instant green roof and trouble-free ownership. LiveRoof’s natural function and natural beauty offer the highest level of green roof performance with ultra-low maintenance costs. The proof is on the roof – showcased in over 1,000 installations that total nearly 4 million square feet. About California State University San Marcos – California State University San Marcos combines the ambiance of a mid-sized, personal, modern campus with the unequaled value of the California State University. Since its founding in 1989, the campus has distinguished itself. Students benefit from the latest facilities and equipment, a superb faculty that enjoys teaching, and a rigorous academic program that prepares students for a successful life in and out of the workplace. A recent survey reported that our annual spending in the region was $161 million, generating a total impact of $307 million on the regional economy. Eighty-five percent of CSUSM’s alumni stay in the region. CSU San Marcos is located on a 304-acre hillside overlooking the city of San Marcos. It is 15 miles east of the ocean; just 30 miles north of downtown San Diego. www.csusm.edu. Marshall University College of Science’s small green roof is making a big impact in raising awareness of green infrastructure. 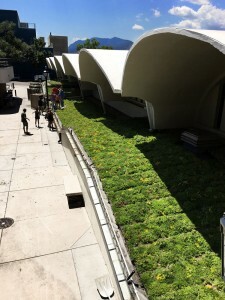 The demonstration roof, installed this fall, uses a blend of shade tolerant green roof plants selected specifically for the Huntington, West Virginia climate. Riverbend Nursery of Riner, Virginia delivered a custom grown mix in the LiveRoof Deep System, using ferns, coral bells and other perennial plant selections. The roof was installed in September and was featured in several news outlets, including on West Virginia Public Broadcasting. Last month, The West Virginia Department of Environmental Protection published a video to highlight the green roof and its benefits.